Good morning son, get reading! 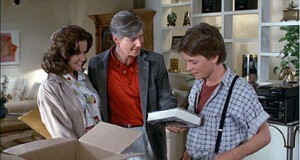 It’s one of my favourite films, and you probably recall the sequence when Marty awakes to find his home life so much better than how he left it. 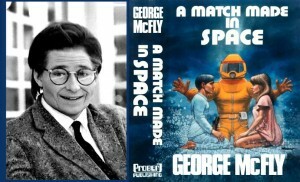 The town bully, Biff, is now buffing his Dad’s car and excitedly announces the arrival of McFly Senior’s new book…A Match Made In Space. Possibly the great American novel? Well, I’ve been putting my mind to something now for the past few years and today is exactly one month mark until my new book comes out! And right on cue, my author copies arrived today. It’s an amazing thrill to hold the physical result of years of work in your hands for the first time! Nobody was buffing my car, but I was home alone with my nearly 17-month-old son. He grabbed one book from the box, ripped it, and promptly drooled on another. I could tell he was just as excited as I was. 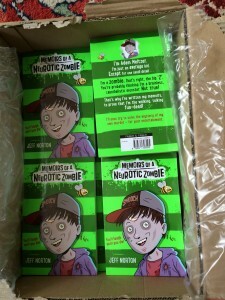 The book is about a twelve-year-old boy with OCD called Adam Meltzer who dies and then comes back as a zombie…to solve his own murder. It’s not as dark as it sounds; it’s actually a coming of age comedy, a laugh out loud take on growing up and learning to be comfortable in your own skin…even if it’s decomposing. Just one more month to go until you too can drool on your very own copy!